A pig god is shaking things up in MTG War of the Spark. The spoilers for MTG War of the Spark continue to roll in, this time showcasing a super god pig. The new expansion, which is set to release at the end of April, focuses on a total of 36 planeswalkers as the war on Ravnica comes to a close. Fans have speculated a return of the Amonkhet gods, but not many foresaw Ilharg, the Raze-Boar coming. 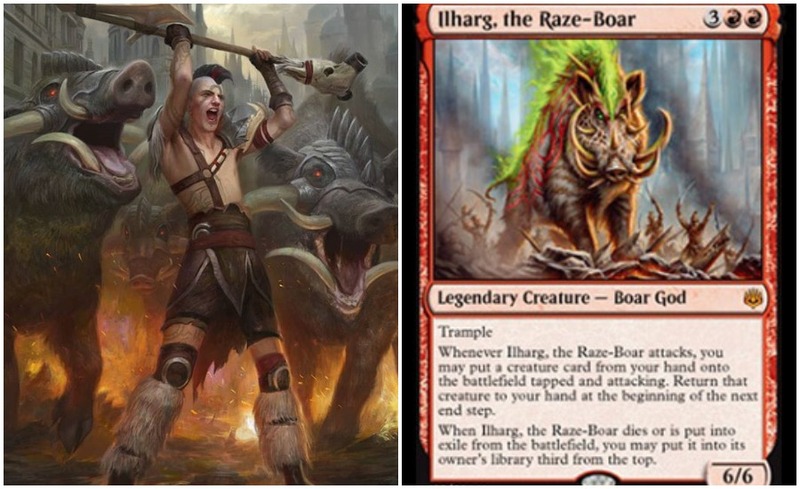 Ilharg, the Raze-Boar is a red Legendary Creature who costs five mana (two red) to cast. His power and defense are a 6/6 and he has trample. But the most destructive part of Ilharg, the Raze-Boar is his two static abilities. “Whenever Ilharg, the Raze-Boar attacks, you may put a creature card from your hand onto the battlefield tapped and attacking,” the card reads. “Return that creature to your hand at the beginning of the next end step.” Free casting is a dangerous mechanic in Magic: The Gathering. But there’s still more. “When Ilharg, the Raze-Boar dies or is put in exile from the battlefield, you may put it into its owner’s library third from the top,” the card reads. Thus, he can’t die or permanently be removed from the game. This seems similar to Champion of Rhonas from Amonkhet, but stronger. Ilharg easily fits into a Gruul deck, beefing up his power levels even more with the enchantment Rhythm of the Wild. Pair his attack with Ravager Wurm and you’re attacking with a potential 13 damage (seven with trample), while also destroying an opponent’s creature or land. If you want life gain and heavy attack power, pair Ilharg, the Raze-Boar with Pelakka Wurm instead. Card draw is an issue with Ilharg and the stars need to line up when casting a free powerful creature. Even with smaller critters in hand, Raze-Boar is a monster who can’t be ignored, especially when cards like Vraska’s Contempt and Conclave Tribunal can’t permanently remove him as a threat. Not even the fan-favorite Ixlan’s Binding can stop Ilharg, the Raze-Boar god.